The iPhone 5, or sixth-generation iPhone, whatever you'd like to call it, is taking shape before our very eyes. , which shows off a white color, nine-pin port and bottoms-up headphone jack. For several weeks before then, we've seen parts here and there, and even a supposedly fully assembled phone. 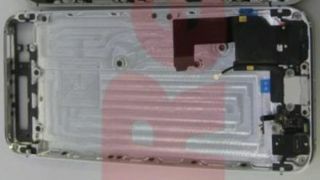 But now, thanks to some plucky scrap finders, we have our first look inside a pieced together next-gen iPhone. The parts are still scarce, so this is only a skeleton outline, but we can clearly see some features marking the next iPhone as distinct from current iOS pack. Most noticeable among what we're seeing here is the diminutive port compared to the 30-pin dock connector in the iPhone 4S, which means faster connection speed and a more reliable connection. Though it doesn't look too much thinner, the iPhone 5 is rumored to be the thinnest iOS phone yet, weighing in at 7.6mm - 1.7mm smaller than the previous iPhone iteration. Also noteworthy is the revelation the phone's speaker looks like it fits inside, just as it does in the iPhone 4 and 4S. If this photo's telling the truth, the next iPhone will have one speaker as all other Apple handsets do. The assembled phone includes the leaked docking port and headphone jack, inserted snuggly into the phone's frame/back casing. Tinkerers at iResq, who put together the device out of scrap parts (how they got their hands on them is another mystery) and found the pre-aligned screw spaces and threading fit like a glove. While many parts are still missing - we likely won't see every cranny filled until September 12 - this helps form a rough idea of what the iPhone, expected to set sales records left and right, will look like on the inside. Speaking of Apple, where is the fire and brimstone we're used to seeing this company throw at leakers? TechCrunch reminisced about the time Apple security and local PD raided Gizmodo editor Jason Chen's house, seizing his computers and other devices as part of a probe into how he obtained an Apple iPhone prototype. Apple still doesn't like leaks, with Peter Oppenheimer, Apple's chief financial officer reportedly saying, "Our weekly iPhone sales continue to be impacted by rumors and speculation regarding new products," however the Cupertino company seems to be focusing its energies on frying bigger fish rather than going after individuals and manufacturers. What impact this new laid back attitude has on Apple's sales and its production environments remains to be seen.